On New Year's Eve every year we stop by the local South Pasadena Rose Parade float construction site. Most of the other parade floats are decorated by commercial float builders but ours is "self-built" by South Pasadena volunteers, which only a few local cities do. I'm including a photo of the finished float ready to head out to Colorado Boulevard very soon. Racing dragon boats this year! The creator, organizer, and leader of our Saturday plein air group hosts an annual paint-out at her house around the holidays. Barbara is so generous throughout the year as planner and faithful painter, then in December she invites us for some morning snacks before painting around her home. Barbara's house in South Pasadena is a terrific craftsman bungalow. On my first holiday paint-out there in 2012 I tried the front of the house since it looked so festive. I posted that piece in Holiday Paint-Out. 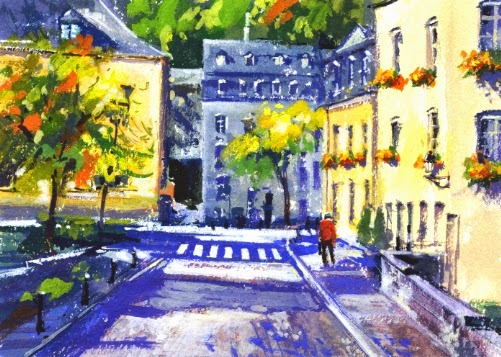 It was one of my first plein air gouache pieces. Last year I painted a bird bath in the back yard. This fall Barbara has had some beautiful, home-grown(! 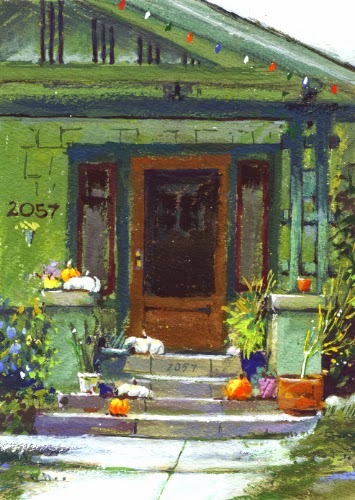 ), white pumpkins on her front steps. I've been admiring them and had to give them a try. The morning was overcast but some sun came out as I was finishing up. What a nice way to end the year with friends and painting. This is my third Christmas blog post! 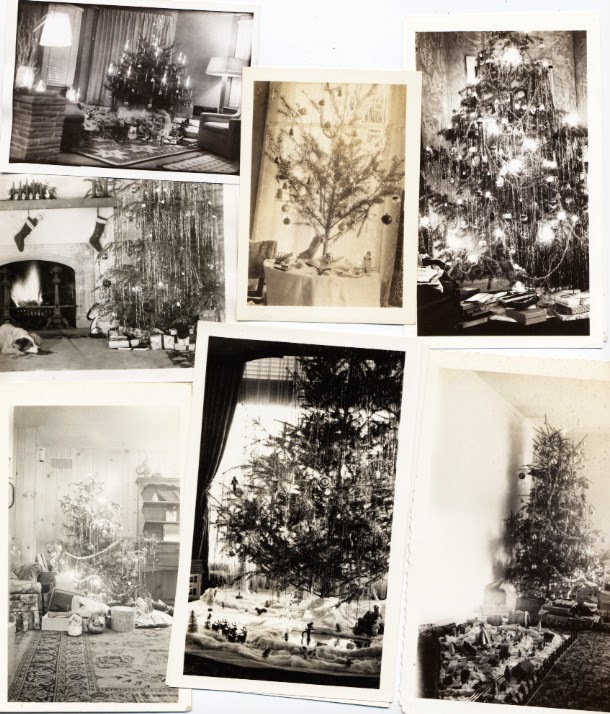 With a few nostalgic "found" photos, I'm sending my best wishes to you all at Christmas! We were at Bailey Canyon Park in Sierra Madre recently for our paint-out. It had rained so the morning was beautiful. There were many dog walkers out for some air. 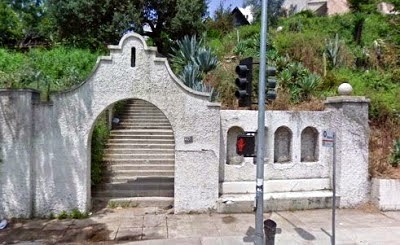 The previous Thursday I had attended the Verdugo Hills Art Association meeting. I went to see their guest artist, Mike Hernandez, who was going to paint a demo in gouache. You know I've been experimenting with gouache for two years and I was curious to see how Mike worked with it. 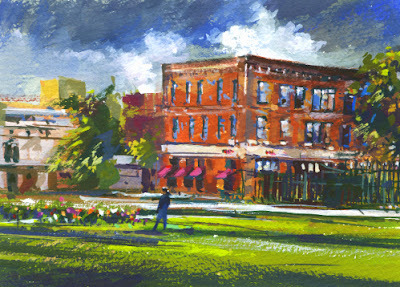 I've tried various ways of plein air painting with gouache. It turned out that Mike's gouache technique was very different from what I've tried. Very exciting to watch. He's such a generous instructor and he brought in many finished pieces to share. It was so much fun to meet him and see his gouache method. At Bailey Park I tried a bit of what Mike did but of course it's easier for me to paint the way I'm used to. I'd like to see another demo! What a beautiful Saturday we had a few weeks ago for painting. 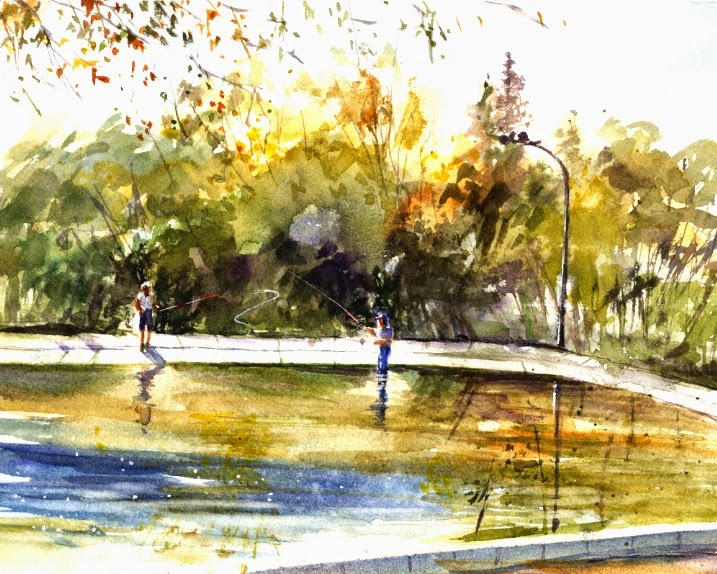 We met at the Lower Arroyo Seco Park Casting Pond in Pasadena. The pond is always peaceful and a little mysterious looking. I painted there once before and posted that piece in The Casting Pond. The water in the pond was low because of the drought here but it still reflected the surrounding trees beautifully. There was no one practicing their casting on my last visit. This time, maybe since it was a Saturday, there were several people trying to improve their casting skills. One man had his waders and walked out into the pond. He also had several different fishing poles to try...beautiful and fun to watch. Our wonderful Saturday paint-out group sometimes paints at a member's home or a member's friend's house. A few Saturdays ago Evelyn, our friend and fellow painter, said we could paint at her house! We're always up for new locations and Evelyn's San Marino home is very lovely, just asking to be painted. The morning started with delicious treats Evelyn was kind enough to have for us. Of course since this is pretty far from the usual paint-out circumstances we felt pampered. Sitting and chatting could have interrupted a lot of painting time. I was thinking of trying a gouache piece of the front of Evelyn's Spanish style home but didn't find shade with a view I liked. I headed to the back yard where there was a pretty patio with a large oak tree to sit under. Perfect! 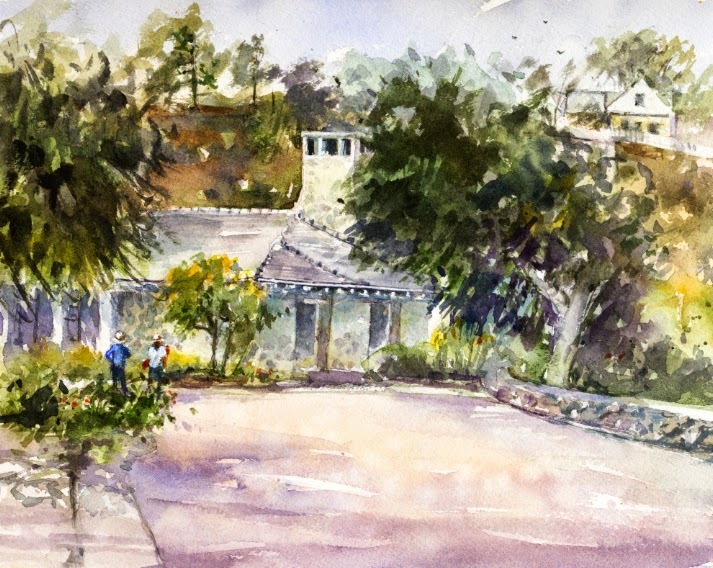 It was just recently I painted at the E. Waldo Ward Ranch in Sierra Madre and posted the watercolor in E. Waldo Ward Ranch. A few weeks later I was at another paint-out there with another group. The ranch and jelly factory property is a nice place to paint. We had a big turn-out of painters since many like to shop in the small Waldo Ward store for holiday cooking and gifts. A visit is always interesting and there are always fun areas to discover. Rusty old farming and canning equipment seems to be everywhere, in a charming way. I chose a view that had some sun on a yellow building with the red barn loft peeking over its roof. While we painted we could smell strawberries. They were making some strawberry jam! The yellow building in my painting is a garage for this! 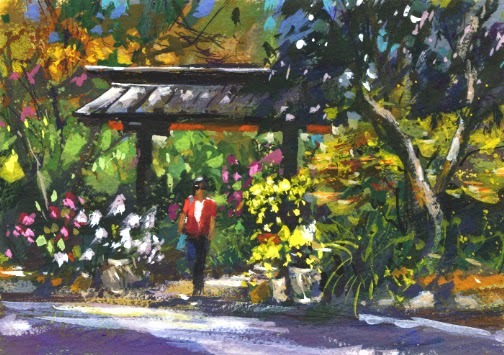 It's always fun and enjoyable to paint at Descanso Gardens in La Canada-Flintridge. 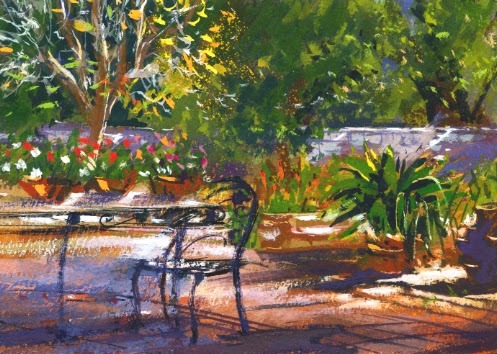 I visited in the spring and posted that piece in Spring at Descanso. On my most recent paint-out day, it was Chrysanthemum time there. Many pots of beautiful Chrysanthemums were set out along the walkways. I had in mind to see what I could find to paint in the Japanese Tea House area. At the entrance to the koi pond there were some very pretty pots of Chrysanthemums on both sides of the gate. The flowers were white and yellow against dark foliage so I decided to try a gouache piece. Descanso Gardens has many tall, old oak trees and also tall Camellias so many walkways have dappled light. I took a couple work-in-progress photos again to share. And also some Spider Mum photos! First colors and values blocked in. More darks and lights, warm and cool colors. It's hard to believe I've participated in the Virtual Paintout for over two years. 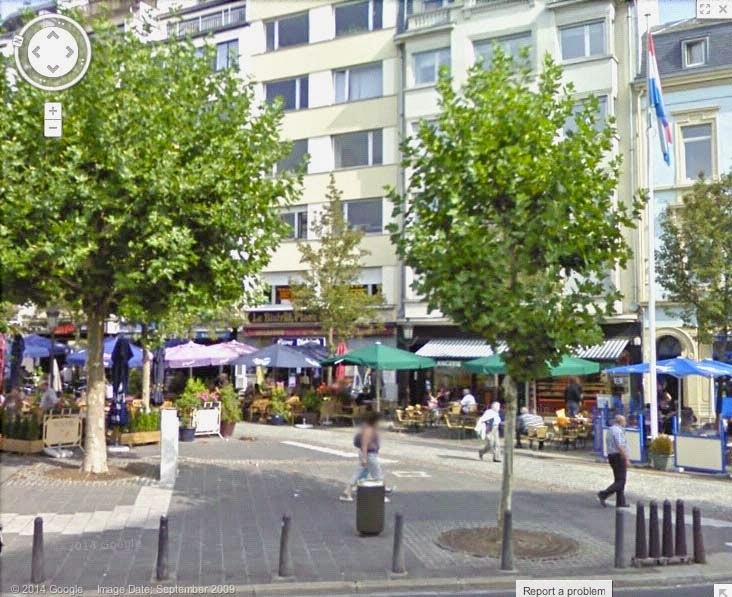 I love seeing parts of the world via Google Street View that I will never see in person. 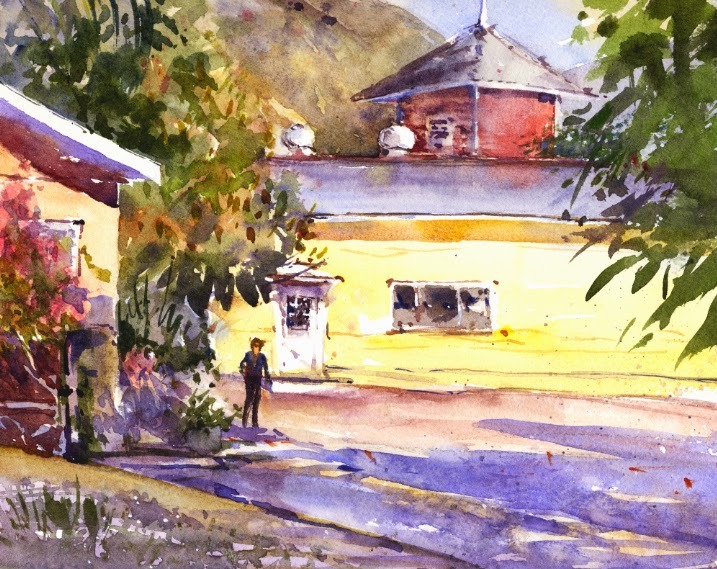 Bill Guffey chooses a location for each month's Virtual Paintout. Artists look around virtually for their view to paint, just as they would on a real life paint-out. Pieces are submitted to Bill who posts all on his blog and on Facebook. I wish we could revisit some cities that were monthly selections before I started participating. 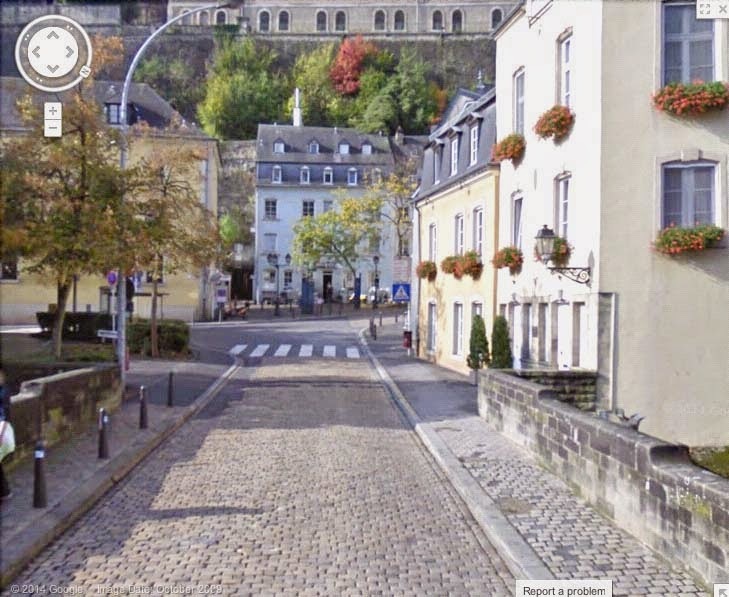 The location for November 2014 was Luxembourg. It looked beautiful there. I wasn't able to spend more time browsing but I only saw one tiny bit of graffiti, something that always stands out. As always I painted two small pieces. Good practice, and having a deadline sometimes is a good thing. Thank you all for taking the time to read this blog! I really appreciate your comments as well. I know it takes time, as I'm always behind on checking other blogs. 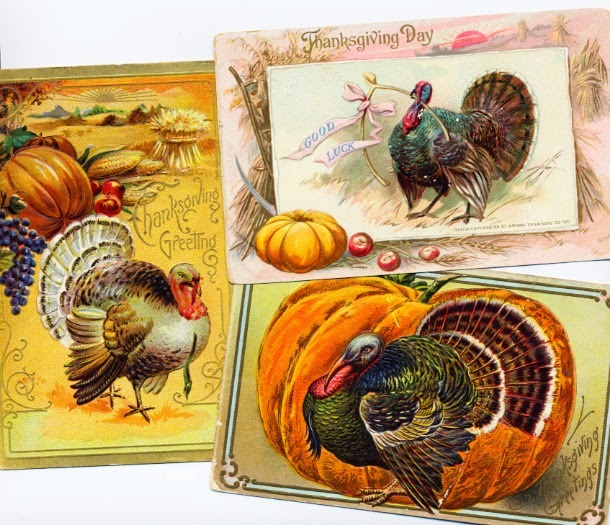 I'm adding three vintage Thanksgiving postcard greetings. These three are from 1909 and have one cent stamps, Penny Postcards. Sending a message or greeting for one cent was an affordable way to keep in touch. It was the Golden Age of American postcards. 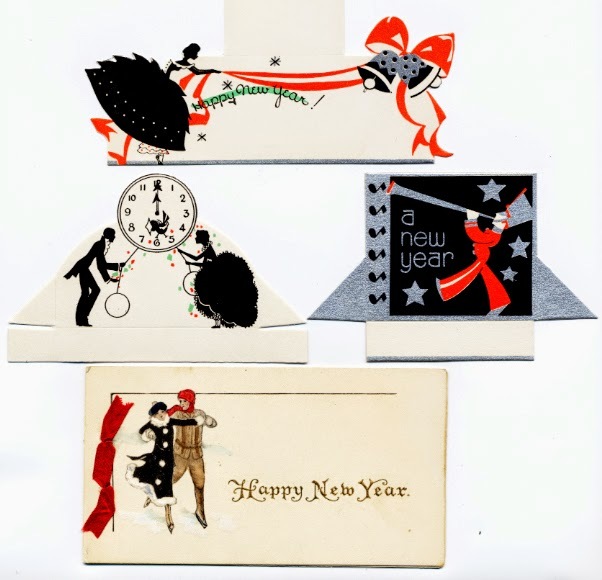 Holiday postcard greetings from this era are very plentiful and easily collected. 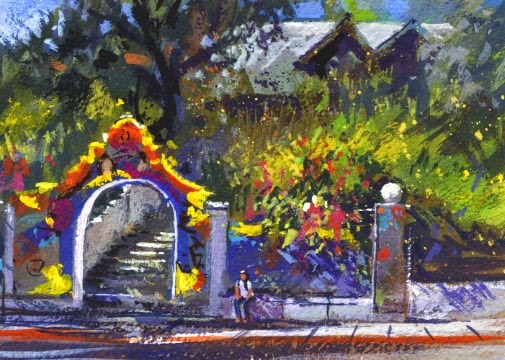 I returned to paint at La Casita in Pasadena recently. It's a spectacular old 1933 building made of arroyo stones. Perched on the edge of the Arroyo Seco, to me it always seems to have a softness about it with its pale, dusty blue trim. I posted my previous painting there in La Casita Del Arroyo. From La Casita there is a nice view of the famous Colorado Street Bridge, which I haven't tried painting yet. Some day! But not on this visit. I painted La Casita again, adding some of my paint-out friends this time. I also took two work-in-progress photos to share. Before the mural was painted in 2010. We thought this looked like the old snack bar. 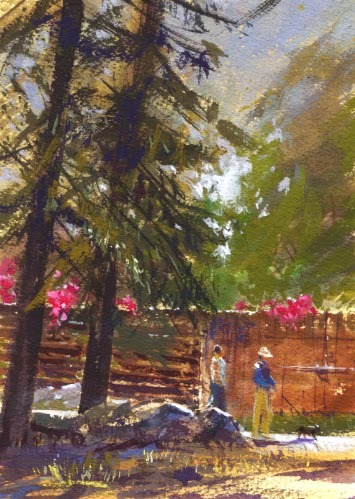 I recently painted at The E. Waldo Ward Ranch in Sierra Madre again. A producer of "Gourmet Food Products", their history goes back to 1891 when the land was bought and orange trees were planted. In 1902 a large, beautiful home and a red barn were built. Both are still in use at the homey property. 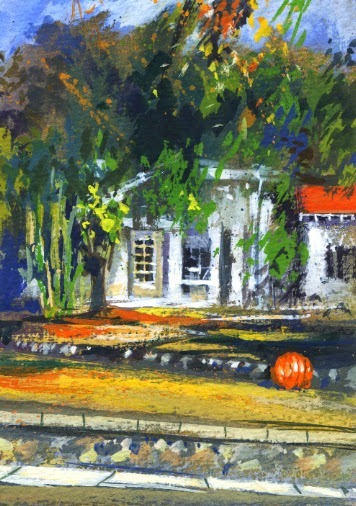 On my first paint-out there, I tried my first plein air gouache piece and posted it in Ward Ranch. 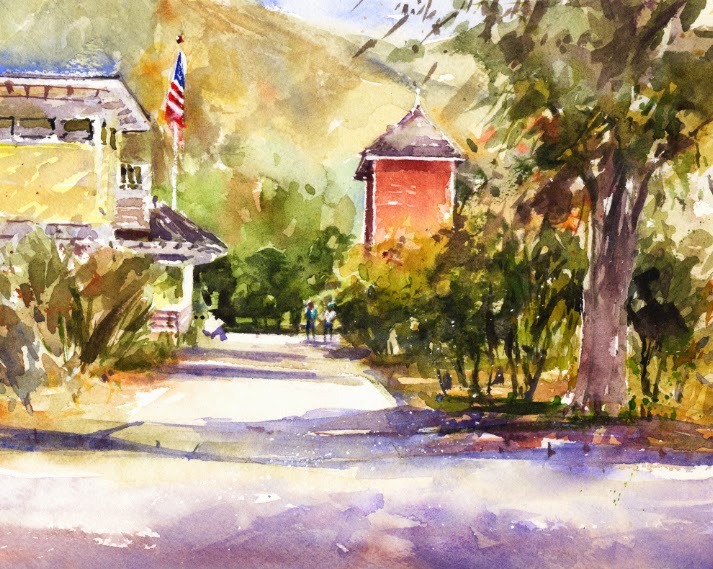 This time I tried a watercolor from across the street, looking down the main driveway, capturing a bit of the old home and red barn. I'm working on applying some things I hope I learned in the workshops I took this summer. One of the paint-out groups is returning to the Ward Ranch soon and I'll have another opportunity to paint and shop in their small store. It's always a fun day. On a rainy Saturday morning the paint-out group met at Central Park in Pasadena. At 8 AM the weather looked like no painting for us, but at 8:30 the sun was out. Central Park has a beautiful view of the historic Castle Green Hotel. 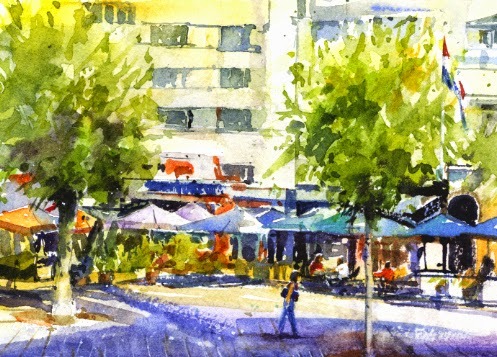 I painted a watercolor of it on my last visit and posted it in The Green Hotel. I like that piece and didn't feel like trying the difficult 6-story hotel again. I looked for another view. There is an old building at the south part of the park which is the home of the Pasadena Lawn Bowling Club that I thought of trying. I finally chose a view beyond the rose garden to an old brick building across the street. Reading its exciting history, built in the 1880s, it was Pasadena's first African-American owned hotel, The Hotel Carver. In the '40s and '50s it was the venue for the jazz and blues nightclub The Onyx Club, later The Cobra Club, where some famous musicians reportedly played. I did something new for me. I took two "in progress" photos of the gouache piece I painted. It's taken me some time, and trial and error to learn how I like to use gouache. There were dramatic rain clouds to add as well. Finally a little rain for us. First stage I'm letting dry some. Second stage and more drying needed. We were back in the city of Sierra Madre on the day before Halloween. Our location for the paint-out was Alegria Street where there were many homes with decorations. The most elaborately done house ended up being on TV that night. While we were there a news crew arrived to film and interview the home owners. They also interviewed some of the painters in our group but they didn't make the news. I chose another, less colorful yard to try in gouache. I loved all of the trees almost hiding the house at the back of the lot, and the chain-link fence in front. There was also a giant pumpkin awaiting a face. As it turned out, I left out most of the trees and the chain-link fence. Maybe another time! 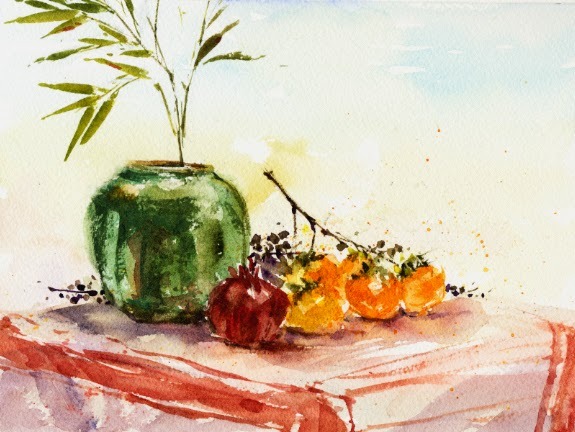 Just a quick report on my substitute teaching gig at an adult education watercolor class. It was a lot of fun of course, mostly because the people were so nice. I took in paintings to show them as well as a still life set-up. I thought we could all paint the still life and I could help with a tip or two. Instead, they wanted to watch me paint the still life...my first "demo". So I jumped in and started painting. Luckily I've been painting regularly and it went OK!